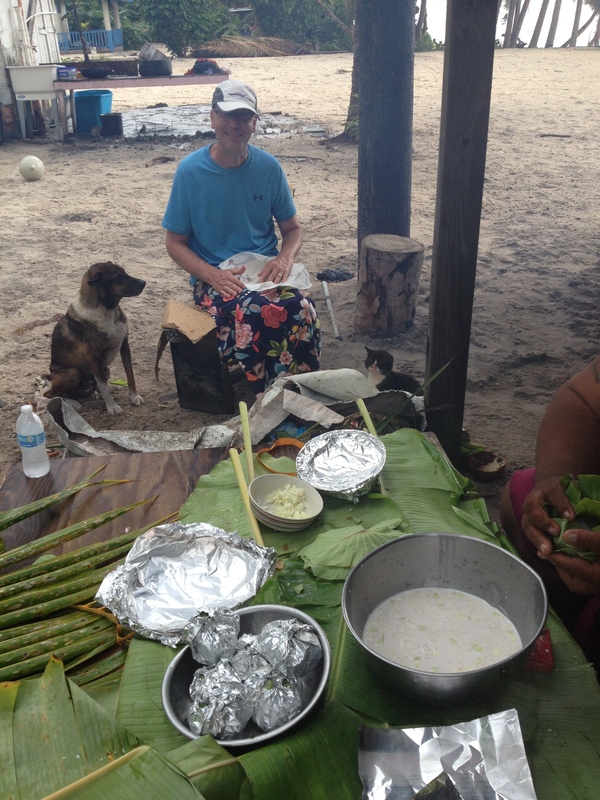 The people on Olosega (Manu’a, American Samoa) are some of the kindest and most generous people I have ever met. This is a close knit community that takes care of each other. I was told that the church feeds the village every day (yes, *every* day) and the people feed the pastor every day! The exchange of food is constant. Whenever there is an event in the village such as a school program, dance, or party, everyone goes home with a fully prepared meal. By this, I mean, you are handed a take out container that contains a meal – every person, every time! These meals may be barbecue, potato salad, sandwich, chips, cake, etc. But let’s get back to the umu. 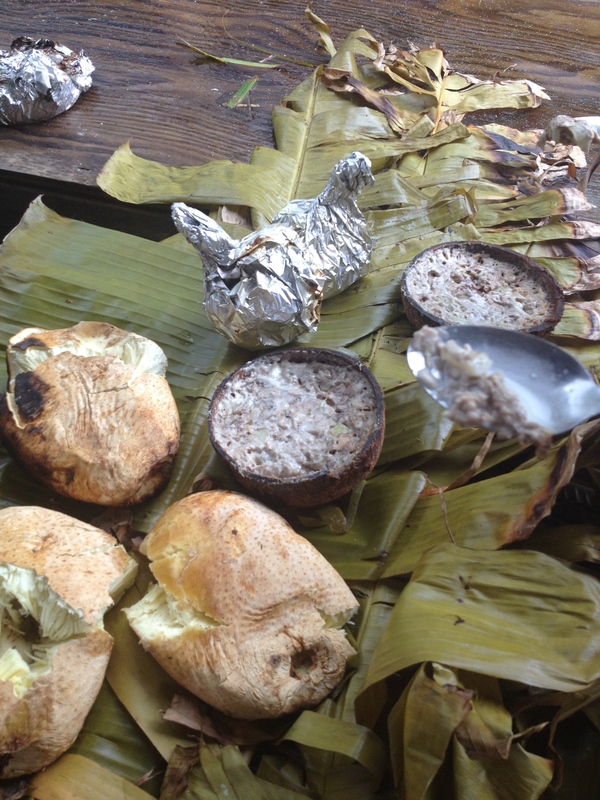 The umu menu is more local and traditional. And delicious! So, the term “the umu” can refer to the place and the food. The place is outside the home where people, mostly men, go to socialize at any time of day. 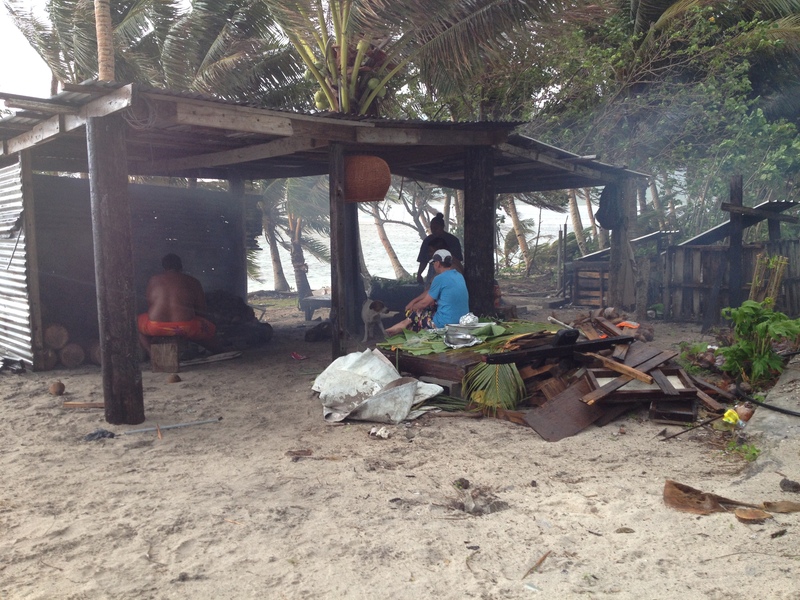 The food is what is cooked inside the umu. 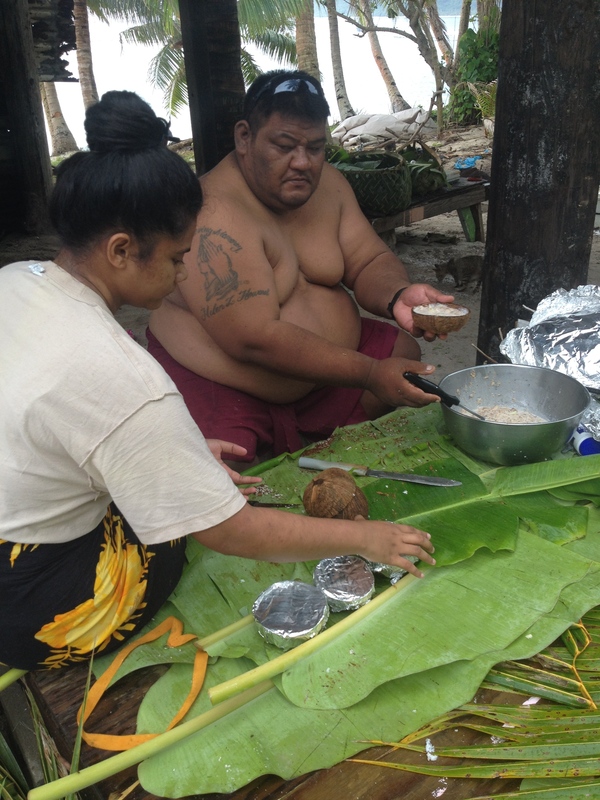 From what we saw, there are some variations in what families cook in the umu. Sometimes a pig is roasted, or maybe not all of the dishes are prepared. But I think there is always breadfruit, taro, and banana. These are peeled and laid on the rocks without further preparation. They are served as is (though I was never served the taro, so I’m not really sure). The other treats are in the little foil bundles, palusami, turkey tail and a mackerel stew. 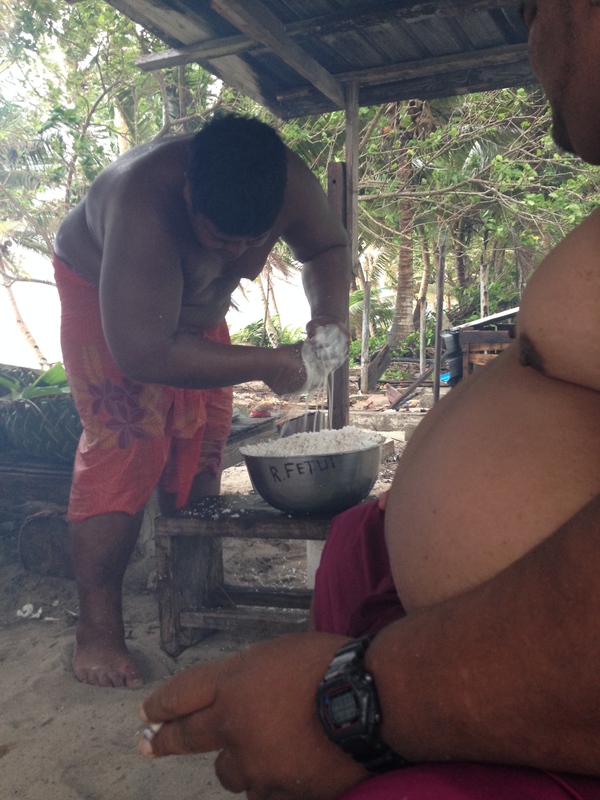 This man husked, cracked and grated many, many coconuts to get all this wonderful coconut cream! The grated coconut is squeezed in a net made from banana stalk fibers. We were impressed by the strength it takes to do all that work! Can you imagine squeezing the milk out of your own coconuts? 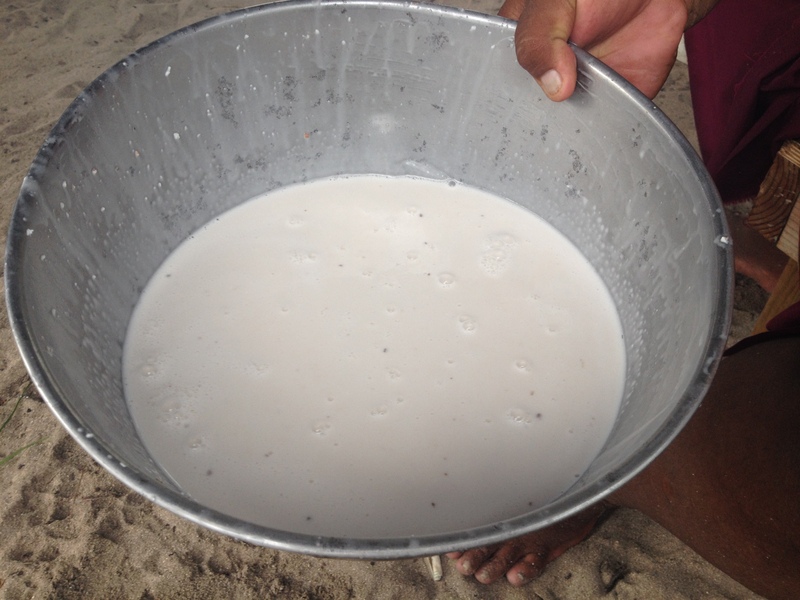 The coconut milk is used for the palusami and the mackerel stew. These are very simple dishes! The trick for the palusami is finding the ingredients. You need fresh, young taro leaves for the palusami. Here, the food is preparation table! The taro leaves are laid in a circle and folded into a cone. Then, a cup of coconut milk and onion mixture is poured into the taro cone. Lastly, this is all wrapped into a foil bundle that will be placed on the hot stones. This is the cooked palusami. It was absolutely delicious! And so simple! Coconut milk and chopped onion in a bundle of taro leaves – yum! The mackerel stew is coconut milk, chopped onion and drained, canned mackerel. The mixture is put into coconut shells, that have been cleaned, and covered with foil.The coconut shells have lots of fibers on the outside and these are shaved off with a machete before they are filled. These are also placed on the hot rocks and are cooked in an hour! Here is the feast! Everyone asks me what the breadfruit tastes like. It can best be described as a potato-like, only with a smoother texture and a little sweeter. You just break off pieces and eat! It was good dipped in the mackerel stew, too! Turkey tail is another of their favorite foods! Yup, turkey tail is that little piece of fat and skin and cartilage that we usually toss out. But not here. Here it is barbecued and used in the umu! 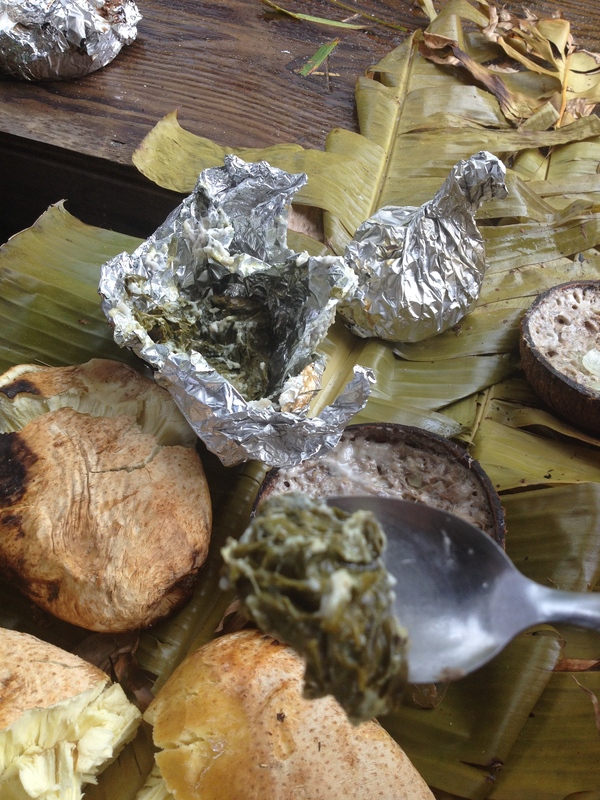 For the umu, it is chopped, mixed with onions and placed in a taro leaf bundle (wrapped in foil).